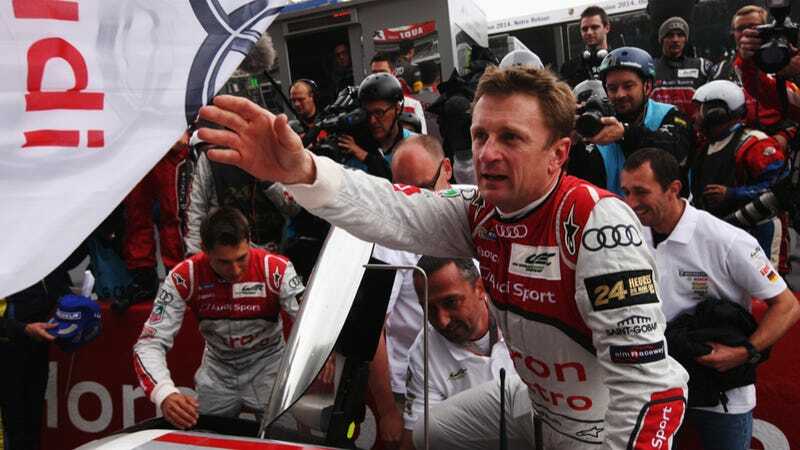 Unexpected news from the Le Mans world today: Allan McNish, former Toyota F1 driver and three time winner at the 24 Hours of Le Mans, has retired. Didn't see that one coming. McNish is a star pilot on the works Audi LMP1 team and there weren't really that many rumblings about him hanging up his overalls, so it is kind of a surprise. What it does mean is that he is hanging up his helmet at the top of his and Audi's game. McNish says that he'll now have more time to spend with his family, though I'd expect that he'd still be involved with the team on a non-driving level. And who knows, maybe we'll see him on track sometime next year anyway. His retirement also marks the second major Scottish motorsports star to retire suddenly, following Dario Franchitti's forced retirement from injuries sustained at the Houston IndyCar race.